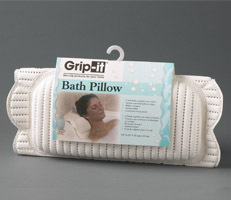 Grip-it Bath Pillow features a cushioned vinyl surface for added comfort in the bath. Great for relaxing in the tub! Suction cups hold pillow in place. Mildew-resistant and antimicrobial to help prevent mildew.